Harley Rouda addresses the crowd at his election night party at the Newport Beach Marriot Hotel. Photos by Daniel Langhorne. Laguna Beach resident Harley Rouda is on track to unseat Rep. Dana Rohrabacher following Tuesday’s election, likely turning the 48th Congressional District for the Democratic Party for the first time in 30 years. Rouda received 94,835 votes to Rohrabacher’s 91,233 votes as of the Indy’s deadline, separating the two candidates by just 3,602 votes. 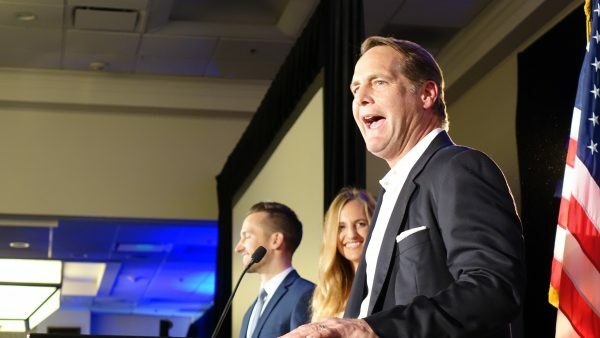 Standing at the podium late Tuesday night with his wife Kaira and their four children, Rouda said his journey to victory started with the election of President Donald Trump in November 2016. Among the other issues on the local businessman’s political platform were championing healthcare as a human right, achieving a meaningful solution to end gun violence, and reforming campaign finance laws. 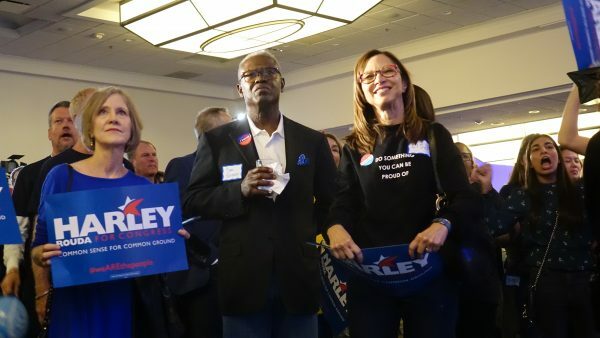 Attendees cheer at Harley Rouda’s election night party at the Newport Beach Marriot Hotel. The National Democratic Committee saw winning Rohrabacher’s seat as vital if it wanted to take control of the House of Representatives, a goal it successfully met by winning dozens of seats across the country. Rohrabacher said to supporters Wednesday that the Democrats and their supporting special interests spent $20 million on trying to oust him. Rouda was able to pull ahead of the veteran congressman by carrying most precincts in Laguna Beach and Costa Mesa. He also took some precincts in Huntington Beach that have previously gone for Rohrabacher. Newport Beach solidly remained in Rohrabacher’s corner. The Registrar of Voters reported Wednesday that it still has at least 418,000 ballots to count that were vote-by-mail, provisionals, election day paper ballots, or conditional voter registrations. It’s uncertain how many of these were from the 48th Congressional District. Rohrabacher did not concede as of Wednesday and his spokesperson said it was still too early to announce whether the incumbent congressman would request a recount in this extremely close race. Cindy Hadden, of Corona del Mar, said she’s supporting Rouda because he wants to prevent the disastrous impacts of climate change and believes in changing gun laws to prevent mass shootings. Newport Beach psychiatrist Lesley MacArthur said she was deeply troubled by Rohrabacher’s support for the Trump Administration’s recent hardline measures against illegal immigration, such as separating undocumented children from their parents. Phyllis Mandel, of Corona del Mar, was also concerned about climate change and believed Rouda would help preserve a livable world for her children and grandchildren. Rouda closed his remarks for the evening by thanking his family and volunteers for their help in getting him to the finish line.